One teacher focuses on student engagement and empowerment through study of history and the U.S. Constitution. The other promotes acceptance of students’ social and cultural identities through multicultural learning and family outreach. 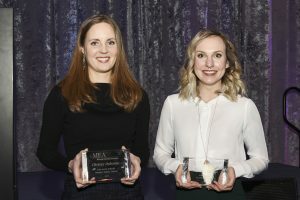 Both educators – Ann Arbor’s Renea DiBella and Royal Oak’s Christy Osborne – were honored for their accomplishments during last week’s MEA Winter Conference. Renea DiBella received MEA’s Educational Excellence Award for her work as a teacher in the Individuals and Societies department at Scarlett Middle School in Ann Arbor. DiBella wrote the eighth-grade U.S. History curriculum at the Title I School, an authorized IB World School. DiBella, who has been teaching for four years, believes education is a vehicle for making the world more equitable. In her class, students write their own constitution and track their own progress against learning targets. Assignments and assessments involve student choice and relevance. 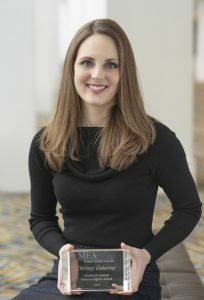 “By using connections between history and current events, I can ignite passion in my students about issues in their world,” DiBella said in her acceptance speech. DiBella co-leads the Scarlett Queer Straight Alliance and helped oversee a student-led walkout against gun violence which grew organically from discussions in class. DiBella said her priority is to meet students where they are. Christy Osborne received MEA’s Elizabeth Siddall Human Rights Award for her work as an ESL Coordinator and K-5 teacher in Royal Oak. Her participation in a Social Justice Project cohort through Oakland Schools led her to develop a “Social Justice League” in Royal Oak. A 17-year veteran educator, Osborne leads the district’s ELL department, including curriculum and instruction, budget, and parent outreach. 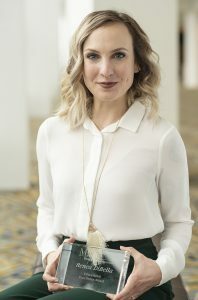 She has offered programs to better connect families to the school community and organized events to encourage multicultural awareness. Osborne and the Royal Oak Social Justice League developed a vision for literature to enhance diversity instruction in elementary classrooms throughout the district. A successful grant recently allowed the purchase of hundreds of books. In her acceptance speech, Osborne told the story of a young ELL student whose life was changed when she first saw a children’s book about her native Gambia in Osborne’s classroom. The main character had the same name – Isatou – as her second grade student, Osborne said.